This work is inspired by walking around the circumference of Wollumbin, or Mount Warning, in northern NSW, as one ascends the mountain. This is the first place in mainland Australia where the sunrise is seen each day. As the climber ascends, her view of the majestic landscape, which was inside a volcano millions of years earlier, subtly changes with altered light and elevation. This is reflected in the music with new layers added to the repeating texture. The harmonic material is inspired by the South Indian practice of "ragamalika" or "garland of ragas", in which a succession of ragas are placed together in one piece of music. First performance by Kylie Davidson — Jan 70. 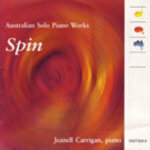 CD: Spin : Australian solo piano works. / Jeanell Carrigan, piano.